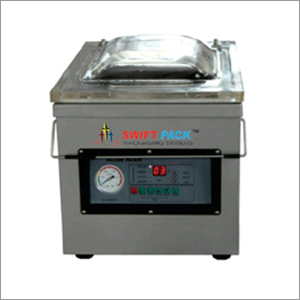 We are well known as the principal Manufacturer, Supplier of Vacuum Packing Machine Table Top. This machine is durably constructed that consumes low energy of 100W, and is lighter in weight (40 kg), so it can be easily moved. It is widely used in various industries such as food, pharmaceutical, and chemical. Use of this machine helps in safeguarding the products from mildew, oxidation, moisture, and corrosion; hence enhancing the storage period as well as freshness of the products. The complete construction of this table top machine is of stainless steel, which contributes towards its sturdiness. We provide this packaging machine in the specification of 'Vacuum Pump of capacity 8m3/per hour and Sealing Size of 280 x 6 mm. For complete specifications of this table top model of vacuum packaging machine, kindly refer the table given below. We welcome inquiries from clients and we assure competitive rates, the best in the industry.